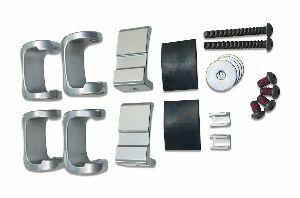 Showing 1 - 3 of 3 Products for Truck Tool Box Mounting Kit. Replaces Standard Railmount Hardware. Allows Toolbox to be installed flush against BackRack(TM). Eliminates gap between Toolbox and Backrack. 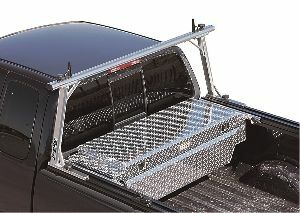 Allows Toolbox to be installed without drilling into truck bed. Standard 21 inches. Optional 31 inches available. The TracONE Toolbox Mount Kit allows owners of the TracONE to safely and securly mount their crossover styly toolboxes to their vehicle. This unique toolbox mount encorporates itself into the clamps of the rack for a low-profile, damage-free fit. The ToolBox Mount Kit is designed to allow you to integrate your toolbox to the TracRac Base Rails. Mounts easily without drilling, bolting or damaging your truck. 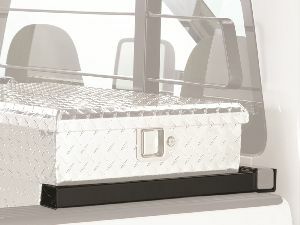 Slide your toolbox back to the tailgate for easy access and painlessly remove your toolbox from the truck for greater cargo carrying capacity.